The Harris County Flood Control District has scheduled new meetings, including a meeting on Buffalo Bayou for July 30, to explain the proposed projects to be funded with to be funded with $2.5 billion in proceeds from the bond election to be held Aug. 25. Officials with the Harris County Flood Control District are holding public meetings in each of the county’s 23 watersheds to receive public input about proposed flood mitigation and protection projects. The meeting on projects related to Buffalo Bayou will be held on July 30 from 6 to 8 p.m. at the Memorial Drive United Methodist Church, 12955 Memorial Drive, Houston 77079. County officials have recently held meetings on projects near Addicks Reservoir, which drains into Buffalo Bayou, and Cypress Creek, which overflows and drains into Addicks during floods. Politicians and others are proposing a new dam somewhere on Cypress Creek to deal with flooding there, although a new dam would be a federal responsibility, not a local project. Stormwater draining into Addicks Reservoir is an acute problem as the too much runoff during Harvey forced federal authorities to open the floodgates during the storm, flooding thousands of homes and killing three people along Buffalo Bayou. The stormwater capacity of Barker Reservoir, which also drains into Buffalo Bayou, is also a problem. Among other issues, residential subdivisions were developed within the known flood pool behind the dam and many homes were flooded during Harvey. 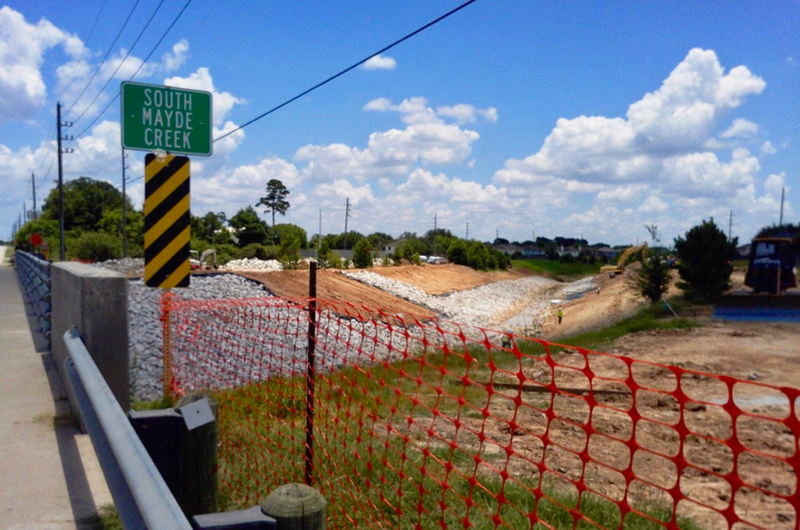 A meeting on Barker Reservoir projects is scheduled for August 1 from 6 to 8 p.m. at Memorial Parkway Junior High School, 21203 Highland Knolls Drive in Katy 77450. The location for the July 10 meeting about projects related to the San Jacinto River has been changed. The new location is Kingwood Park High School, 4015 Woodland Hills Drive in Kingwood, 77339, from 6 to 8 p.m.
Also upcoming is a meeting on projects related to Little Cypress Creek. That meeting is scheduled for July 31 from 6 to 8 p.m. at the Richard & Meg Weekley Community Center, 8440 Greenhouse Road in Cypress, 77433. These meetings have been declared to be special meetings of Harris County Commissioners Court so that members of Commissioners Court may attend and participate. The purpose of each meeting is to describe some of the projects proposed for the anticipated 2018 flood bond election and to solicit residents’ input on which projects should be included. For a comprehensive description of the types of projects the county intends to fund, as well as further information about meetings, a map of projects, and how to comment, visit the flood control district’s webpage. Meetings are also listed on Save Buffalo Bayou’s Calendar of Events. Previous Are Costly Flood Basins Proposed Where Natural Basins Already Exist on Buffalo Bayou?